The Neuromax 1002 CE by Xltek was designed specifically for EMG/NCV/SSEP testing. This unit was refurbished by our trained service technicians. It comes with a fully supported one year warranty. The package includes the main laptop instrument with two factory installed USB drives, network connector, 2 channel active preamplifier, electrical stimulator, carry case, starter electrode kit and operator's manual. 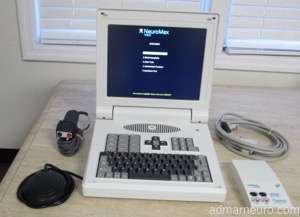 The 1002 has a high resolution 12'' flat panel display, standard 88 character laptop keyboard, and two USB drives for archiving patient data. The active preamplifier supresses stimulus shock artifact,which is especially useful for sensory studies. An Installed USB drive upgrade is available. The Xltek mobile stand as shown in the photo is also included with your Neuromax purchase. 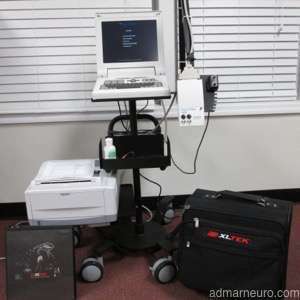 The system is sold by Admar Neuro Diagnostic Instruments, Inc. specializing in EMG/NCV instrument resale and service. A one year fully supported warranty. The sale of this device is regulated by the FDA as well as may be subject to regulation by state and local agencies. As such, I will verify that you are an authorized user and purchaser of medical instruments. • Has no internal moving parts; no disk drives or other moving components that can wear out or fail over time. It is the only 100% solid-state EMG system available! • Is strong, lightweight and designed to withstand the test of time. Only the highest grade of impact-resistant PC+ABS resin is used to house NeuroMax CE and its preamplifier. • Is now almost 3 lbs (1.5 kg) lighter than previous generations. • Features buttons/keys of extremely high quality, designed for 20 million operations. • Features a keyboard strengthened with metal posts for improved rigidity & feel. For the clinician on-the-go, portability is a top priority. The NeuroMax CE system is the only portable EMG ready to be used right out of the box. • Is completely self-contained; no need for cumbersome setup & connection to an external notebook PC. • Is ready to use in about 30 seconds; a typical notebook PC takes at least 2 minutes of start up time before it is ready for use. • Weighs only 11 lbs (5 kg), making it the lightest portable EMG system available!